TAIPAN@Ipoh Cybercentre will provide the initial commercial/business centre as an avenue for commercial activities within the township of Bandar Meru Raya, a 1,600-acre integrated, self-contained township located at the North Ipoh Growth Corridor, a private-sector driven initiative, spearheaded by PCB Development Sdn Bhd as the Master Developer, and fully endorsed by the State Government. The development is located just off the Jelapang Interchange, on the way to Chemor. According to Mr Vincent Tiew, the Head of Marketing & Sales – Andaman Group of Companies, a major portion of Meru Raya has been zoned MSC Cybercentre – the State Administrative Centre in the making, “a Putrajaya and Cyberjaya combined,” he quipped. A total of at least 20 government agencies have already confirmed moving to this location, with a few already relocated there, including Jabatan Audit Negara, Kompleks KDN (Kementerian Dalam Negeri) and Jabatan Perhutanan. Kompleks Pejabat SPRM has also been completed. Others like Ibu Pejabat Bomba, Jabatan Kesihatan, Jabatan Perikanan, Yayasan Perak, have all been approved to move there under the 10th Malaysian Plan. A total of 11,000 residential units have been planned for the entire township, of which quite a sizeable portion has been completed. To cater for the population, on the education front, Kolej Poly-Tech MARA, with an expected enrolment of around 1,500 students, will also find its place here, besides the pre-requisite primary and secondary schools. “The Ipoh International School – Tenby has also purchased a 13-acre lot and will start construction soon, moving from its present location near the Polo grounds,” Mr Tiew added. 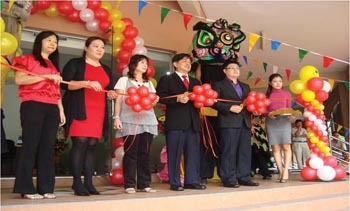 TAIPAN@Ipoh Cybercentre will have 102 units of offices and shop lots ranging in price between RM688,000-RM2,215,000 with completion expected by end 2012. I’m sure the occupants of Greentown Business Centre will be happy to share the privilege of hosting relocated hawkers. If you are a property buyer make sure you ask the Andaman group for a special “no-business-possible-after-5pm” discount. If you don’t what I mean come visit the premier Greentown Business Centre at 6pm – and imagine you run a business there.